Let’s be honest: Siri for Mac isn’t as exciting as we thought it would be. There’s no really fast way to trigger the virtual assistant, and for some reason she feels slower to respond on a Mac than she does on your phone. It turns out, Siri isn’t the only assistant you can try out on macOS: thanks to MacAssistant, you can also give Google Assistant a try. This unofficial client for Google’s API isn’t perfect, but it can answer questions really quickly. Even if you love Siri for Mac, it’s worth giving this application a try to see just how responsive Google’s virtual assistant can be. To get started, head to the MacAssistant releases page and download the latest ZIP file. You can unarchive just by clicking it, then drag it to your applications folder. Mac Assistant runs in the menu bar. 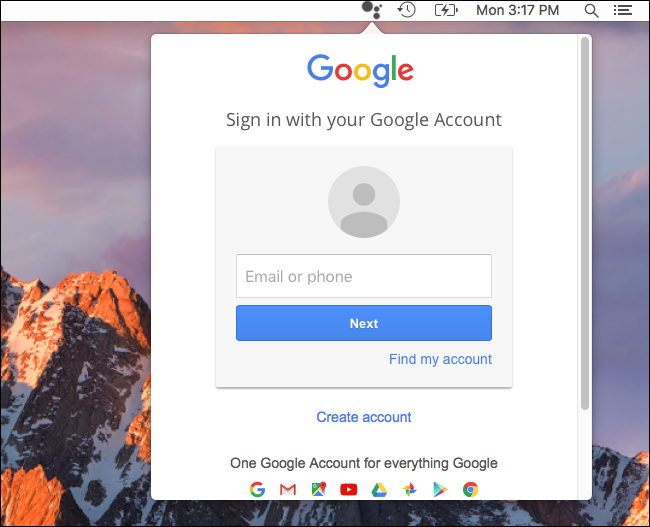 The first time you click the menu bar icon, you’ll be asked to sign into your Google account. After that, you’ll see a microphone in the pop-up window. Tap it to start talking to Google Assistant. You can also trigger the assistant by tapping the left Command key two times. There’s not a lot in the way of visual feedback: you’ll see the words you said transcribed, and that’s about it. As of this writing, there’s no way for the application to visually show you things, and you won’t get the file system integration like Siri offers. You can ask questions, and that’s about it. Even so, it’s remarkable how quickly this tool can react to speech. I asked it about the weather, my calendar, and obscure questions about world leaders, and got answers instantly. I even asked it how many tablespoons were in a quarter cup, and found out right away (it’s four.) Give this a shot, and compare Google’s responses to Siri’s. Neither is perfect, but it can be fun to compare the two, so enjoy.